‘Three Little Wolves’ follows ‘The Big Bad Wolf”, being the third cartoon in the ‘Three Little Pigs’ series. Penned by Joe Grant & Bill Cottrell, it introduces the Wolf’s three sons, who anticipate Huey, Dewey and Louie (who would make their cinema debut two years later, in ‘Donald’s Nephews‘). They even speak in a similar way. The wolf, on the other hand, suddenly has an inexplicable German accent. In this cartoon he dresses up ridiculously again, this time as Bo-Beep, but he does manage to lure two of the little pigs to his house. When he closes the door, the pigs turn red and say ‘why, Bo-Beep!’, as if they’re being seduced. Of course, the wise pig comes to the rescue, this time using an elaborate Rube Goldberg machine, called the ‘wolf pacifier’. 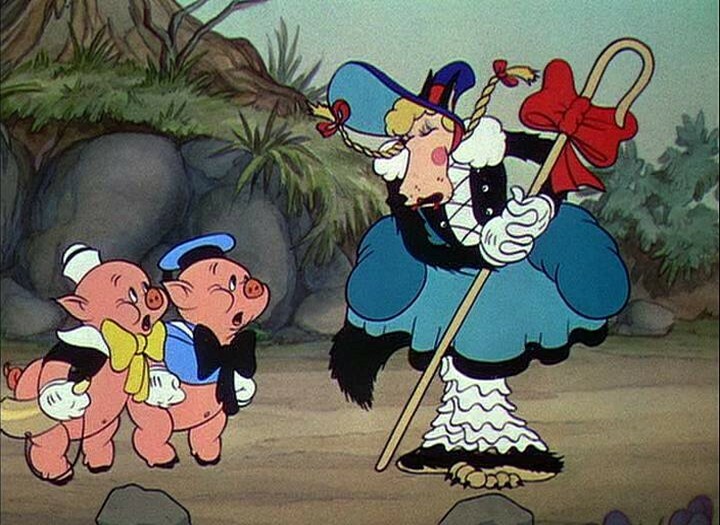 The three little wolves would return in the last ‘three little pigs’-cartoon, ‘The Practical Pig’ (1939), but in the subsequent comic strip only one would remain, and he eventually would befriend the pigs, contrary to his lookalikes in this cartoon, who are even more aggressive than their father. The end-shot of this cartoon was later reused in the propaganda film ‘Food will win the War‘ (1942).